So it's cover central around here lately. But I can't help but post these lovely pretties as they are revealed. 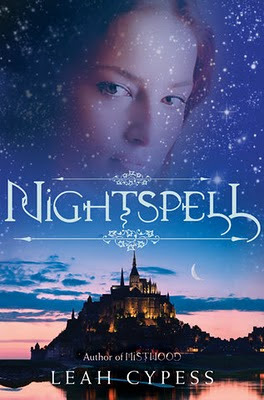 Today Leah Cypess brings us the cover for her upcoming companion novel to the excellent Mistwood --Nightspell . This is not a direct sequel but rather a standalone novel set in the same universe. Nightspell , like Mistwood , centers on a strong female lead. Her name is Darri and she's facing down a handful of insanely complex family issues, a land where the dead walk, and a handsome ghost prince. Um, yes please! I honestly can't wait to get my hands on it. Due out May 31st. This looks great. I'm so excited for this. I loved Mistwood. I think it's really pretty. My only thought was that when I first saw it the N looks like an R.
Ooh. Fun. I just finished Mistwood last night. It was excellent in so many ways and choked full of surprises. Thanks for posting. And, can I just say, that I have been going through some serious Angieville withdrawals these last couple weeks. It's a compliment. I'm just a big fan. grin. Oooh Nightspell looks gorgeous! I'm glad Leah Cypess decided to write a companion novel to Mistwood. I hope this one is just as good as her first book. Eeee me neither! Now how can we cajole Leah Cypess into giving us ARCs of her next masterpiece...? Oh, it's lovely! Thanks for posting. I too cannot wait to get my hands on this. I liked Mistwood but didn't love it as much as some, but this one sounds super intriguing. The cover is gorgeous! Wow, that cover is just so pretty I would have bought it for that reason alone!